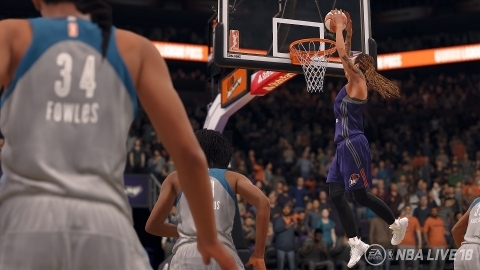 Electronic Arts Inc. (NASDAQ: EA) announced that WNBA teams and players* will be playable in NBA LIVE 18, launching this fall on Xbox One and PlayStation®4. The WNBA will be available in WNBA Play Now, and teams and player skills have been specifically balanced to reflect the unique playstyle of the league and skills of its players. This is the first time the official WNBA’s roster of teams and players will appear in a video game, and will be available only in NBA LIVE 18. "On behalf of the players, we believe that combining technology and entertainment is a powerful way to not only recognize and value our brand of basketball but to also increase fan connectivity and engagement,” said Nneka Ogwumike, WNBPA President/LA Sparks. In order to incorporate the league’s teams and players, the NBA LIVE 18 team conducted head scans of star athletes like Maya Moore, Brittney Griner, Diana Taurasi, Tina Charles, Sylvia Fowles, Alisha Gray, Chelsea Gray, Jonquel Jones, and Alyssa Thomas, and held motion capture sessions with 2017 WNBA Draft first overall pick, Kelsey Plum, among others. Additionally, game creators fine-tuned player ratings and skill moves in order to present the league and its stars in the most authentic way possible. Fans will be able to experience the best of the WNBA when NBA LIVE 18 launches this Fall. NBA LIVE 18 is developed by EA Tiburon and will be available worldwide this September for Xbox One and PlayStation 4. EA Access members receive a 10 percent discount** when they purchase a digital version of NBA LIVE 18on Xbox Live.